Notes: Orebro Castle is a medieval castle fortification in Orebro, Narke, Sweden. It was expanded during the reign of the royal family Vasa (House of Vasa) and finally rebuilt about 1900. The castle lies on an island in river Svartan. Some of the rooms are used as classrooms for pupils from Karolinska Skolan. 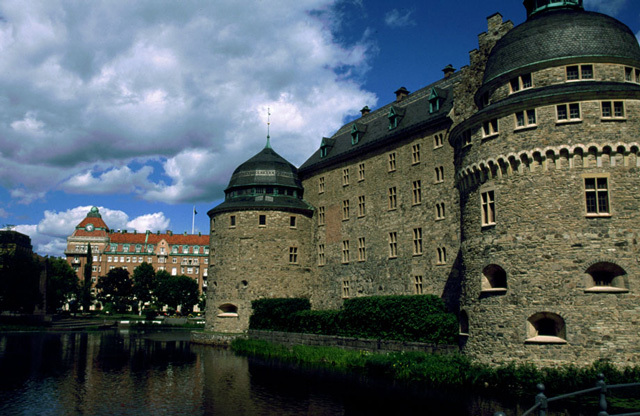 For over 700 years Orebro Castle has kept a watchful eye on everyone crossing the bridge on the River Svartan. The oldest part of the castle, a defence tower, was erected in the latter half of the 13th century. This tower was added to in the 14th century to make a larger stronghold, and towards the end of the 16th century most of the impressive castle we see today was built. Many important events in Swedish history took place here. For over two hundred years it has been the residence of the county governor, but a great deal is open to the general public, with art, music, food, exhibitions, guided tours, conferences, and lots more.